I just thought I would share a few stories that I found on my newsfeeds this week. The BBC today had a story about British Waterways who are looking to add hydroelectric turbines to some of the land it owns alongside the canals. It is hoped that they will produce enough electricity to power 45,000 homes and generate £1 million for British Waterways. According to Now Public our Horse Chestnut trees are under attack again. First it was a fungus, and now it is a Greek Moth that is creating havoc with our conkers. 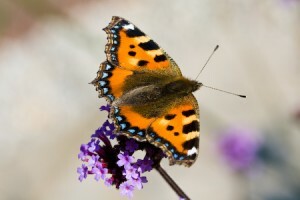 The moths are spread by the wind and have so far reached the Midlands. Fortunately it is believed that the trees will be able to withstand the damage and will be back to their leafy best next year. New Scientist reports on some research which is looking at different forms of fungus for use in the desulphurisation of crude oil. Although this approach is not new, the latest find would, at first sight, appear to be more efficient than previously discovered sulphur removing bacteria. The advantage of this approach is that it is carried out at room temperature unlike traditional refining which requires temperatures up to 455oC and pressures 200 times atmospheric. The Economist reported that bears are being given a bad press in North America this Summer with increasingly lurid stories about bear attacks grabbing the headlines. Although bear attacks resulting in injury or death are relatively uncommon (only 13 incidents in North America this year with only one fatality), this is not stopping the news reports fuelling peoples’ fears as more people venture into bear territory whilst out walking, cycling and camping. Stories telling how one man survived by playing dead whilst the bear “tried to eat my brains” certainly won’t help. Finally, No Impact Man is trying to start a campaign to stop people buying bottled water. Although he does live in America, many of the sentiments hold true whichever side of the pond you are on. These include cost, the energy consumption to make the bottles, the waste from the bottles, transportation of the bottles and bottled water and the fact that he claims many of the water companies are buying up water rights. He is asking people to stop using bottled water and to just fill a bottle with tap water – something we have been doing for a long time. I had wanted to share my successes in the sphere of growing produce, but, at the moment it feels as though the fates have conspired against me and sent plagues of slugs and clouds to stop me in my tracks. Instead I thought I would highlight something that has worked better than I thought. For some time we have been wondering what to do with the front garden. So, after a year or two of indecision (a relatively short amount of time for us) we decided to remove the lawn completely (this part of the decision was made relatively easily as other than looking green lawns are relatively dull, it was deciding what to put in its place that took the time). The aim of our back garden is to produce somewhere tranquil and shady with variations on a theme of white and green. It is somewhere for us and for the birds (assuming we can keep the aforementioned killing machines away). The front is a complete contrast to the back. It is south facing, remains relatively warm in the winter, although the wind whips visciously across it, and we don’t feel the need for tranquility. I wanted something that would brighten the day whenever I saw it. 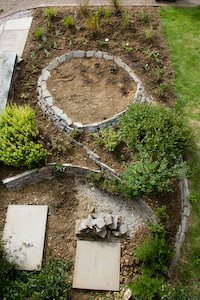 It was also meant to become a haven for insects whilst allowing me to grow flowers to photograph. (Following the destruction of some of my brassicas I am beginning to change my mind about the first objective). Where the back garden has been controlled and planned, the front has become a riot of colour and, as a consequence, a haven for insects. The planting started at the end of June (although we already had some thyme, sage and oregano installed from an earlier attempt to work out what to do with the space) and mainly consisted of some grasses that we had bought for the back but which did not now fit with the current plans (I think we are onto at least Plan K), seedlings that if I didn’t plant somewhere would probably die, and some Verbena and Osteospermum kindly donated by James’ mum. As you can see, it looked a little sad when initially planted in June. 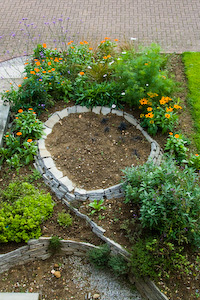 Now, thanks in part to some pot marigolds that I was careless enough to allow to self seed last year, and the lashings of rain, the garden has been transformed. I planted some white cosmos which has reached 5′ in height, and, for the first time I have managed to get some rudbeckia to grow. I have today just done the first bit of dead heading on these, and they are full of flower, with many more to open. However, the star of the show has to be the Verbena Bonariensis. This has flowered solidly for more than a month and looks in no hurry to stop. It positively glows in low light, and, more than anything else in the front garden, has become a magnet for butterflies, bees and hoverflies. What’s more, they sit so still on this flower that even I can manage to get a good photograph (and lots of poor ones) of the butterflies.